Hello everyone,I’m back after a short break.Had a fantastic holiday in UAE and now I’m back in action.Have taken few food pictures which I will post in the coming days….Today I will share a recipe on seafood.Mori means shark fish and this dish is prepared with the dried shark.Amma used to prepare this dish often when we were kids but I wouldn’t eat it then since I disliked the smell.I started to eat it few years back and since then I have never looked back.Traditionally it was prepared by roasting the dry fish in the fire directly,but now we roast it in the gas flame.Best combo with this dish is red rice Konji but I like it with the rice. Roast the fish on the gas flame on both the sides on slow flame,skin side facing the flame on slow flame first. Once done,transfer it on a paper,scrape the burnt part and sand if any,use a pounding stone and separate the flesh and shred it into pieces. Wash it if desired,drain water and keep it aside. 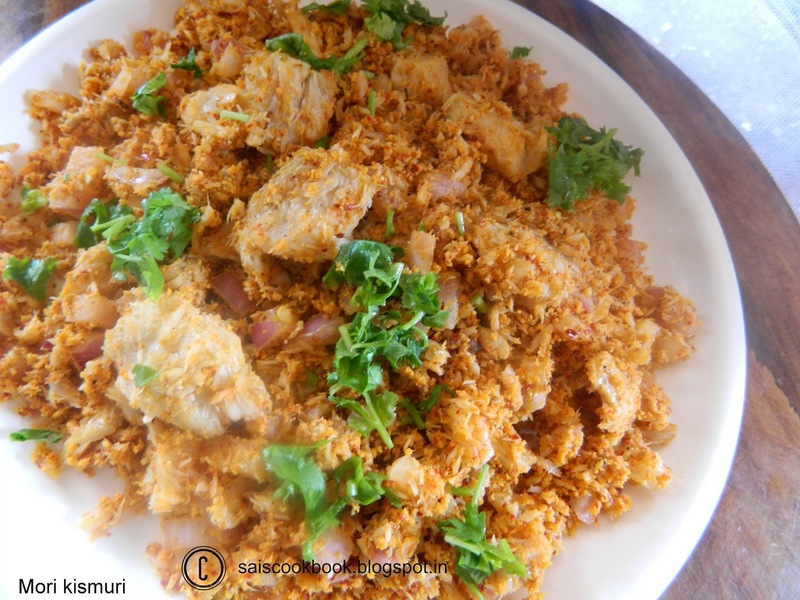 Grind the ingredients mentioned under ingredients for the masala without adding water to a coarse masala. 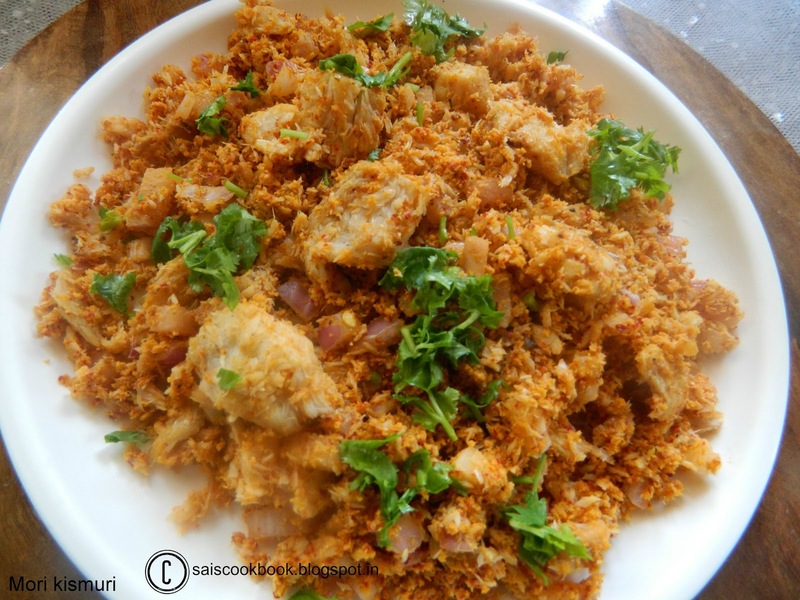 Transfer the masala in a bowl,add the shredded fish,onion,green chilly,coriander leaves and salt to taste and give it a mix. Be careful when you add salt since dry fish has more salt content. Serve it as an accompaniment with the main course. 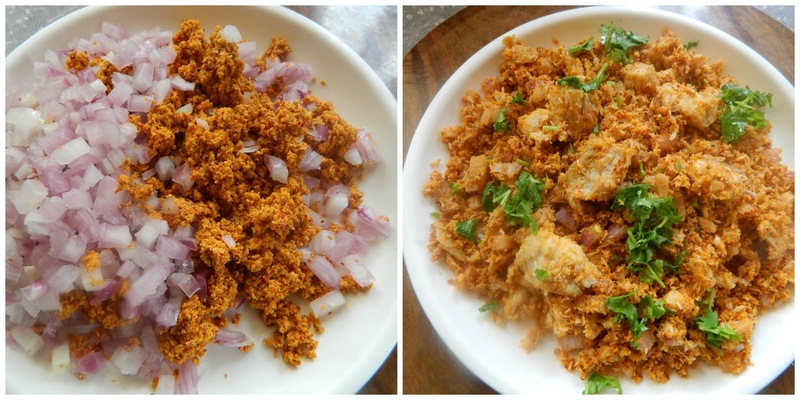 You may also fry onions in oil for 5-6 minutes,add masala and remaining ingredients and saute it for sometime. This procedure is done since the dish stays for a long time.